In the days when Filofax made a wider variety of pages, you could buy a pre-printed shopping list, which you could use to note down your grocery needs under various headings. I never used them, partly because the headings were a bit arbitrary, but mostly because I felt it was a lot of money for only a small productivity gain. But then I got married and found that shopping from a list someone else had made was no fun at all. My wife would write the list in the order she thought of things. Imagine my mileage as I wandered to and fro along the aisles, visting each department multiple times. My new shopping list page makes it all easy. 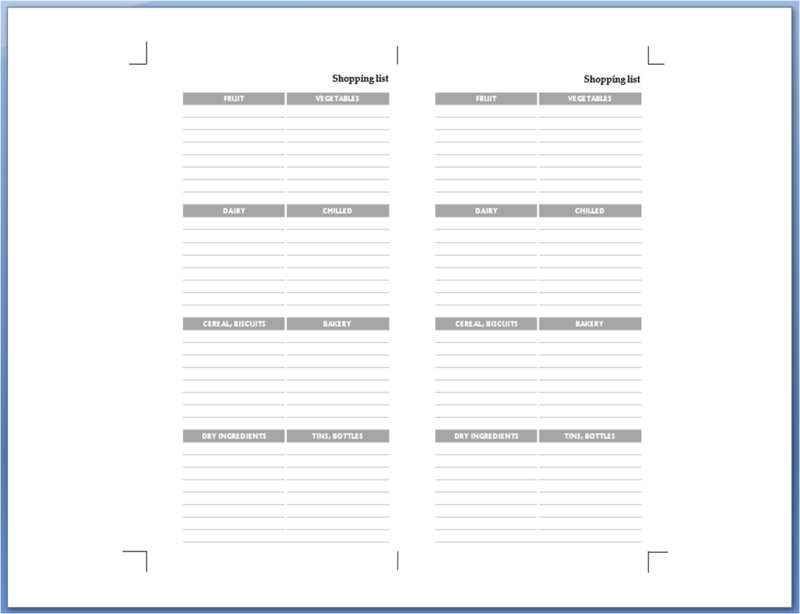 Across a double-sided personal page, I can write a super-organised list. The categories are listed to match the layout of my supermarket, but they tend to be laid out similarly. If yours is different, you should find the template straightforward to edit. If you'd like to use the shopping list, you can download either an editable Word file or an Adobe PDF file. 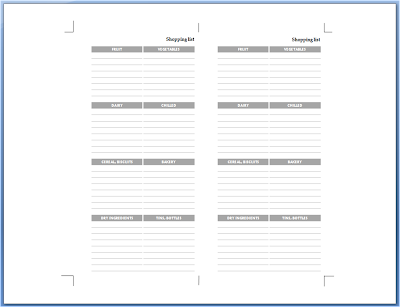 Both files contain two A4 pages (the first is pictured above), which you should print onto a single sheet of paper. If you have a duplex printer set it to flip on the short edge. If your printer will only print on one side, you'll have to experiment with manually refeeding between prints. The front of the sheet has crop marks to allow you to position your ruler perfectly when cutting out the pages with a craft knife. The front of the page is set with a left-hand gutter, the back with a right-hand one. This allows for the holes, of course. I still don't really enjoy the shopping experience, but my mileage inside the supermarket is much reduced. Look at it this way - you'll need less blank notepaper! I love the sound of a 'vintage stationery company'. There should be more of them. just found this! Such a great idea, but its for Personal not Pocket! Upset! I hope you bring one out soon!